Denny Hamlin led four times for a race-high 76 (of 200) laps Sunday at Pocono Raceway, but a flat left-rear tire under caution with less than 50 laps to go led to myriad problems for the #11 FedEx Ground Toyota down the stretch and a 19th-place finish. Starting fourth and staying amongst the top-five as the laps clicked, Hamlin was third when the caution flew on Lap 156. Crew chief Mike Ford called for four tires and an adjustment on pit road, and quick work by the FedEx crew kept Hamlin in third. However, Hamlin radioed a potential flat tire before the green flag. After the crew confirmed it, the tire came off, causing left-rear quarter panel damage and snapping the rear brake line before Hamlin came back down pit road for repairs. With a wounded car, no brakes and restarting back in the pack in 21st, Hamlin did his best to gain spots before the checkered flag behind eventual winner Jeff Gordon. Hamlin was the class of the field for the first half of the 500-mile event on the 2.5-mile “Tricky Triangle,” taking the lead for the first time on the second lap. The 30-year-old Virginia native led through a handful of green flag pit cycles. 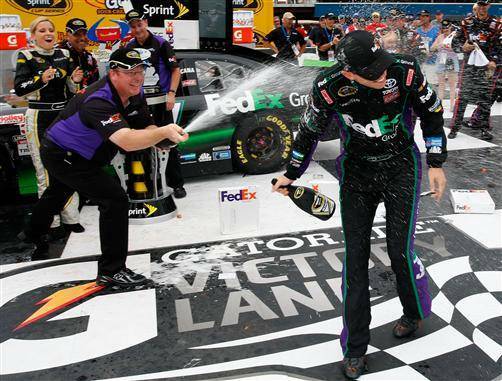 The finish dropped Hamlin one spot to 12th in the NASCAR standings after 14 of 26 regular season races. Hamlin is making his 11th Cup Series start at Michigan International Speedway (MIS) and the 202nd of his career Sunday in the #11 FedEx Office Toyota Camry. Hamlin is the defending race winner at Michigan, leading 123 of 200 laps in June 2010 en route to victory lane at the two-mile track. It was his first victory at Michigan, and he followed it with a runner-up finish in the Series’ return trip to MIS last August. Hamlin has four top-five finishes and six top-10 results in 10 starts at the track — including four-straight top-10 runs, dating back to a third-place in June 2009. In total, Hamlin has completed 1,928 of 1,935 laps (99.6%) in his career at Michigan, leading 140, with an average finish of 10.9. The FedEx Office location in Bentonville, Ark., currently leads the company’s President’s Club program, and will be recognized with its “1588″ code numbers on the b-post of the #11 FedEx Office Toyota this weekend. How tough is it for you to put Pocono’s disappointing finish behind you? How has your confidence level changed at Michigan over the years?